Firefighters are battling a blaze which flared up in Hartenbos Heuwels, Mossel Bay around noon on Monday, Working on Fire (WOF) said. "It is being fanned by strong winds," said WOF spokesperson Lauren Howards. They have sent aerial help, which includes two spotter planes and a helicopter. The George Municipality said they sent a crew, a firefighting vehicle and a helicopter to help their colleagues in Mossel Bay. The SPCA in Mossel Bay was also assisting with the moving of pets out of the area, according to the Mossel Bay advertiser. Preliminary reports on social media said at least two houses were evacuated as the blaze threatened homes. Elsewhere, a grass fire had also broken out near the Outeniqua Research Farm outside George and another at Kammanassie, in an isolated region outside George. The Southern Cape Fire Protection Assocation (SCFPA) said of Kammanassie that tyres were burning and that the fire spread into vegetation. The George Municipal Fire and Rescue Service sent a unit from the Uniondale Satellite Fire Station and the SCFPA also sent a unit from the Uniondale base. 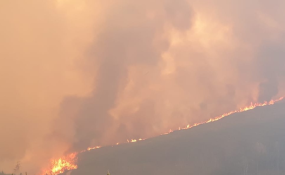 The latest fires along the southern coast of the Western Cape come after the recent fires in Betty's Bay, approximately 300km from Mossel Bay, as well as around the Hermanus hills and near Houw Hoek Pass.